Lately I've had home offices on the brain. I think it's because I have a home business and absolutely no semblance of an office. We use our second bedroom as a TV room…it's ugly as can be and is definitely not "blog-worthy." We don't even have a couch in there, just my old double bed pushed up against the wall which we use as a big couch. And our oversized chair that recently got replaced by my pretty new club chairs? Yep, smooshed right up against the old bed in a terribly ugly storage/seating solution. This particular room also acts as my "home office," meaning it offers the most floor space for me to do accounting, tagging, crafting and organizing. Glamorous, huh? This one makes me think it's in an old house in the hills of Tuscany. I might get more dreaming than working done here! 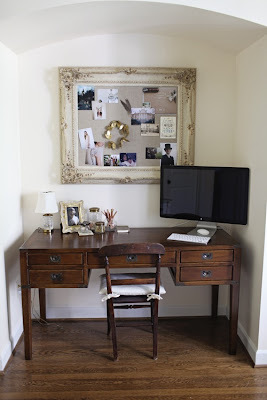 This is the home office of blogger Caitlin of Roost. You have got to see the whole tour...every detail is stunning. 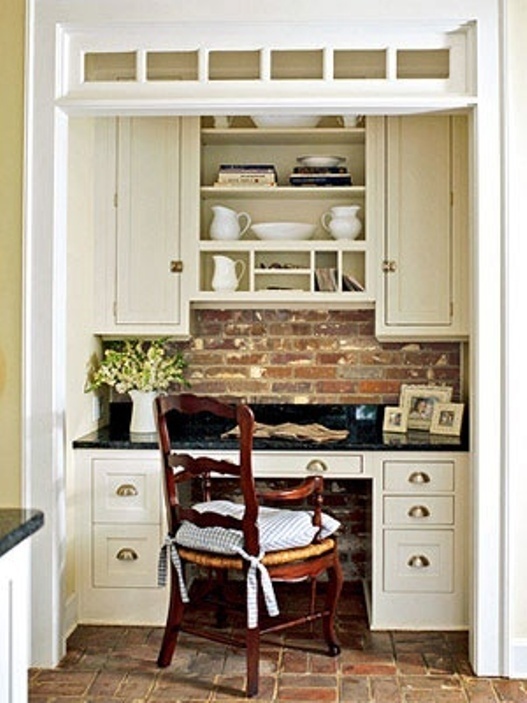 A built-in office in the kitchen. My parents have lived in the same house since I was born, and my mom has always pined for one of these. This makes me think of her : ) I love the brick, the bin pulls and the open shelving. An industrial artist's space...love it! 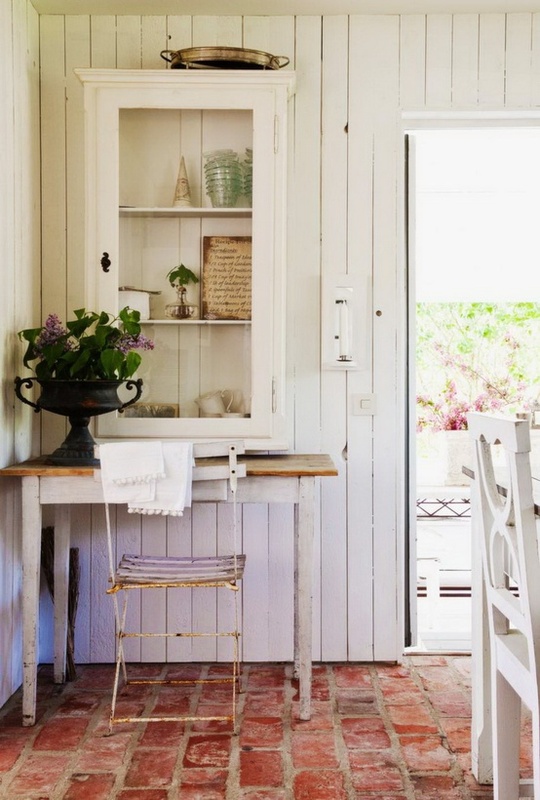 Clean, airy and refined-rustic. A lovely office. This little space has a lot of interesting details and textures. Very charming. It would be sweet in a girl's room. This might not be an office, but I love this image. The planked walls, brick floors, antique bistro chair, farmhouse table, old cabinet...the whole thing is perfect! 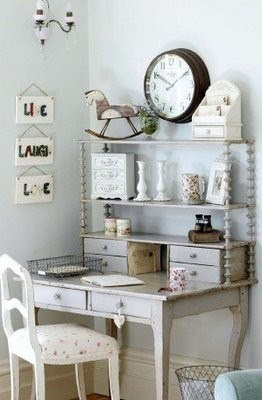 This image best represents a modern home office with vintage details. I love it all! 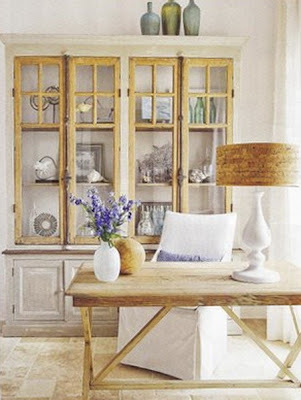 A very serene, sophisticated space with lots of curated collections. 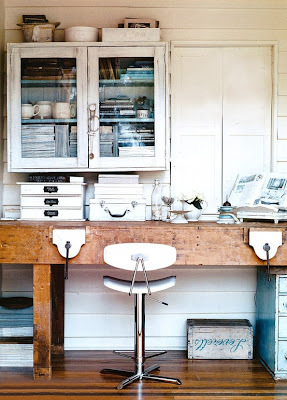 And finally, another blogger's home office space. This one is by Maria of The Grower's Daughter. Again, the entire tour is just lovely. I absolutely love all the antique touches and architectural salvage. So tell me, which of these spaces would you like to work in? 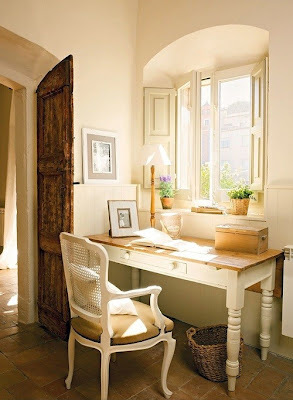 Beautiful working spaces. The tables are gorgeous. I just bought one table, and love it. Oh how I would love to have any of these...mine looks like a cyclone and dust storm coverged in one place most of the time! Fine office inspiration you collected here. The second one is just great to work in. You can ease up on your long work day by getting some air from that window. Hope you will have one fine office space that you are dreaming of soon. Those are lovely office spaces! Each has a distinct feature about it that appeals to different personalities. But I think the most important thing about having a working area is that you have to keep it clean and organized because it helps in conditioning your mind to work as well. These are very beautiful office spaces, I'll absolutely show this to my friend. We currently have this project about CBD Office Rental in Singapore and we are also looking for inspiration where we can get ideas about the dos and don'ts. Thanks for sharing this post Courtney! the interior and all are very enchanting, subtle and exquisite. I like the arrangements of furniture as well. I think i will be applying this to my newly bought freehold condo at tampines!